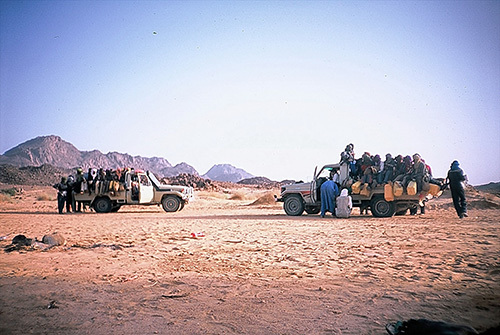 The aim of the project was an analysis of the recent transnational Tuareg society – called ishumar1 – and their strategies of mobility, belonging and territoriality in the central Sahara. What is the future of (ex-) nomads? Are they becoming settled citizens or disrooted “borderliners”2? Can we label these modern nomads as cosmopolitans, or are they just to call vagabonds by their ruptured life which characterized through transnational mobility? The analyses of the last 15 years of the development of the Ishumar-movement3 (teshumara) clarified, that Ishumar are both: Cosmopolitans and vagabonds. Moreover a certain part of the Ishumar society has to be understood as intellectual elite, characterized by transnational movements, arrangements and negotiations with national states, and multifarious contacts to neighbours and Europeans. This new elite has nothing in common with the traditional political, economic and religious “excellence” and is no longer ascribed to the traditional Tamasheq-term “anefren, the one who is chosen”, but to the term “anafrag, the one who is able or capable”. In recent times, the leaders of the rebellion, the guitarists and the few NGO activists embody the new elite. Only their multiple forms of mobility granted them their cosmopolitan way of life and their capability of knowing of human rights and fight for them in the recent insurgency on uranium and justice in Northern Niger. 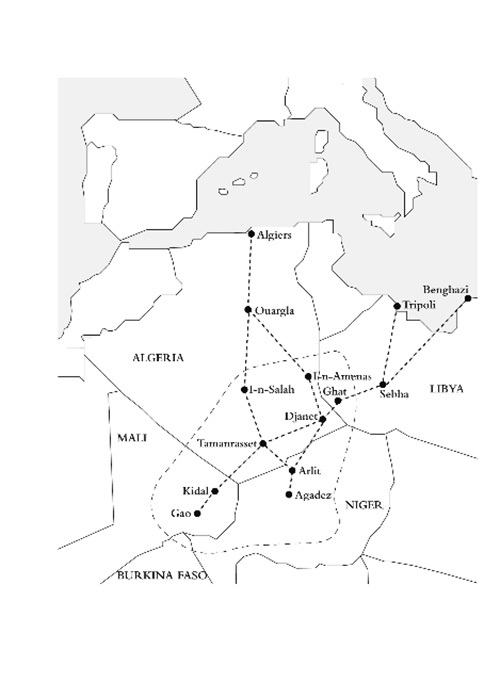 A sketch of transnational mobility of ishumar (called afrod) in the borderlands of Libya, Algeria, Mali, and Niger. The continuous line represents the original territory of Tuareg from which ishumar break out and head especially to Algeria and Libya in order to get employment. The ishumar-movement incorporates all kinds of moving: It can be described as partly in cycles, partly situational, sometimes seasonal, sometimes permanently, but always irregularly. So I would suggest calling ishumar with James Cliffords term (1992) a “travelling culture”. Ishumar embody a multiple travelling culture with multiple citizenships, multiple places of residence, and multiple strategies of moving. For ishumar moving is the rule. But their multiple movements are only possible due to very sophisticated strategies: Desert knowledge and know-how, the use of kinship affiliation and the benefit of multiple citizenships. Those strategies allow the ishumar to pursuit their transnational movements, which are part of their culture and the only way of escaping their prison of political marginalization released by French colonialism, corrupt African regimes and still widely supported by European politics. A young ashamur from Niger is waiting for transport to Algeria. His luggage is stuffed in a fold trouser. (Photo: Ines Kohl 2008). Based on Hawads4 first classification on the Ishumar movement (teshumara) from the beginning in the 1960ies up to the 1990ies, I completed the development with emphasis on the last 15 years. Hawad´s classification divides three periods: the phase of the mangal, a wire frame with coals for cooking tee (l´étape du brasero), the phase of the shakmara, a shoulder bag (l´étape du shakmara) and the phase of the kalachnikov (l´étape de la kalachnikov). My contribution starts in the beginning of the 1990ies and tries to provide each phase with certain characteristic developments of (changing) norms and values, political or economic circumstances, or additional inventions and progresses. The name ishumar got a new dimension followed by supra-regional publicity and was applied to the generation of rebels in general. Those ishumar involved in the armed rebellion were perceived as a certain elite of society. They should lead their people to independence. The rules of honour and decency (asshak, tekarakit) abolished among rebels and young men. Visible expression was the men´s veil (tagelmust), he was no longer worn in the name of honour, decency and respect, but in a – from the traditional point of view – partly in shocking manner without covering chin, mouth and forehead and sticking out moustache and scalp hair, or as an attractive accessory. Among ishumar the traditional men´s veil, the chech or tagelmust, is no longer an expression of honour, decency and respect, but more often an attractive accessory only (Photo: Ines Kohl, 2007). A new style of music was born: guitar. Some rebels have chosen a new form of presenting their identity. Among the first guitarists was Abdallah Oumbadougou who gained importance through calling the nomads to the rebellion. The lyrics of these guitarists expressed protest against the status quo, criticised the system and put their thoughts on migration, modernity, and politics into words. By their poems and songs they as well embodied an intellectually elite5. Afrod, the illegal border crossings, developed to its culmination. Lots of ex-rebels and Ishumar from Niger and Mali have not been integrated into the states and started to move between their places of origin and Algeria and Libya to fulfil actions of smuggling, trading and migration6. The term ishumar was disconnected with the former elite and transformed to a “phenomena of vagrancy”7 attached with moral devaluation. ishumar were all those in migration or exile in Libya or Algeria, who refused to work, lived for the moment without being worried about their future, completely forgot their parents, siblings, and relatives, and acted beyond the traditional norms and values8. Through the Sahara tourism in Libya new working possibilities (cook, guide, driver, silver jewellery seller) turned out and resulted in regular and seasonal movements9. 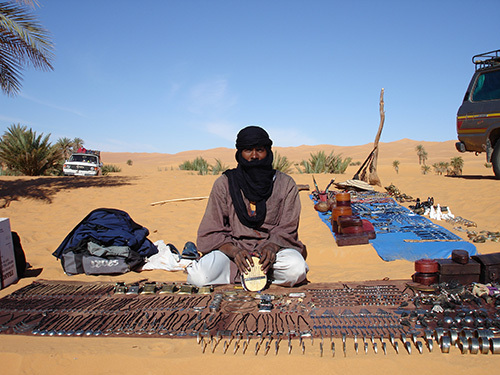 On touristic interesting sites, such as Mandara in Libya, Nigerien ishumar sell silver jewellery (Photo: Ines Kohl 2008). Finally the guitar was flourishing. Lots of young ishumar tried to escape their vicious circle of missing chances and perspectives by jingling guitar on weddings and private parties. But whereas the majority of (half professional) guitarists just copied the well known “heroes” (Abdallah Oumbadougou, Kedou, Hasso, or Ibrahim Breboun and Abdallah Alhassan), only few were successful in creating new lyrics and sounds (like Moktar Bombino, Koudede, Bob Moma, or Nabil Othmani for example). 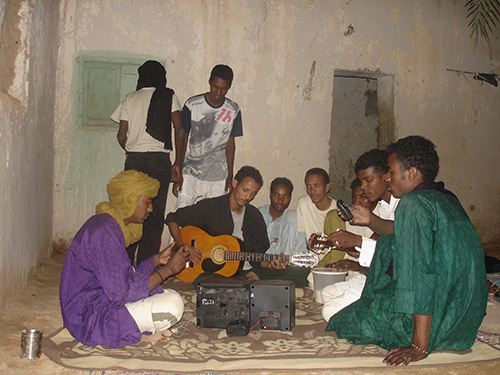 Young ishumar tried to escape their vicious circle of missing chances and perspectives by learning guitar, and copy the well known “heroes” of Tuareg music, such as Tinariwen, or Abdallah Oumbadougou. (Photo: Ines Kohl, 2008). 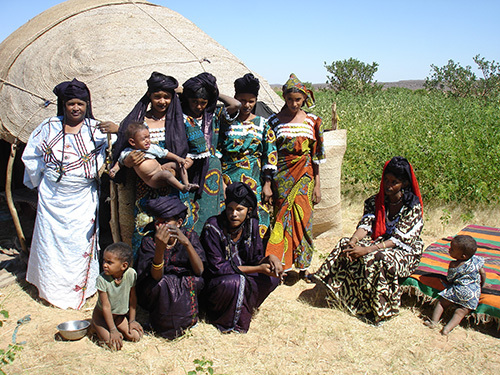 During the last years Niger and Mali started to register their nomadic society and equipped them with citizenships. Additionally Libya and Algeria founded a system with which they integrate (or assimilate) ishumar into the state by issuing citizenships or at least temporary limited identity cards with which one can stay in the respective state without the permanent fear of getting caught by (mostly EU-initialised!) deportations. This development involves that most ishumar possess meanwhile multiple citizenships with often varying names, places and dates of birth. 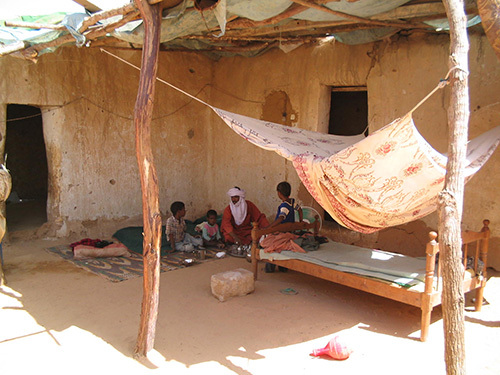 Ishumar live in shabby conditions in Libya. Partly they occupy houses of the old town the Libyans have abandoned beginning with al-Qaddafis modernization in the 1970s. (Photo: Ines Kohl 2005). In connection with the political integration into Libya and Algeria lots of ishumar are entering a period of sedentarisation. As a consequence, their status is changing. Indeed, they are still ishumar in the sense of trans-regional mobility, yet experience a different value than their unmarried fellows. Those new resident Tuareg refuse the nomination ishumar because the term refers to people acting beyond traditional norms and values. Their status of being a family, however, corresponds to their original conception of respect, modesty and honour. By the time of writing this report (July 2009) it is too early to make prospects for the future, as far as the peace negotiations between the MNJ and the Nigerien government are still diverse and unclear. With the analyses of the teshumara development we can answer the main question whether Ishumar are just modern nomads, or cosmopolitans or better to be described as vagabonds. In the teshumara we can find all three metaphoric concepts in varying times and implementations. Yet we can go so far and say, that they are all at the same time. But that is not the point. No matter if some ishumar act like vagabonds, others live like cosmopolitans, the clue is that a certain part of the ishumar society has to be understood as intellectual elite. Because of their transnational movements, their arrangements and negotiations with national states, their contacts to neighbours and Europeans, they see more, hear more, know more and understand more than their nomadic fellows, who just move in cycles in their relatively bounded territory. This new elite has nothing in common with the traditional political, economic and religious “excellence”10 and is no longer ascribed to the traditional term “anefren, the one who is chosen”11. I would rather suggest that the term “anafrag, the one who is able or capable” superseded the old transliteration of “elite”. Somebody who is able to understand the global coherences (through school education, language knowledge, transnational mobility and contacts, etc.) and who has the potential and the possibility to express himself (through the knowledge of new media, etc.) will become the new leader of society. In recent times, the leaders of the rebellion, the guitarists and the few NGO activists embody new elites. Only their multiple forms of mobility granted their cosmopolitan way of living and their capability of knowing of human rights for example, to fight for them in the recent insurgency on Uranium and justice. The second main part of the project dealt with the question of terminology: Are ishumar migrants, are they exiles or even a diaspora community, dissidents, refugees or just seasonal labourer? With which term could or should we label them? Currently I am the opinion, that neither the term refugee nor the definition migrant is really suitable for the Ishumar. And I think it is not important, in which concept we try to put them. I agree with Alessandra Giuffrida that “the study of mobility through conceptually isolated categories (i.e. pastoralists, exiles, refugees and labour migrants) has not been conductive to understanding mobility as an overarching system in all its variations.” 12 Mobility itself gives us the clue and shows, that “mobility among Tuareg is a system, or subsystem, as well as a strategy” (Giuffrida ibid.). The ishumar movement incorporates all kinds of moving: It can be described as partly in cycles, partly situational, sometimes seasonal, sometimes permanently, but always irregularly. So I would rather suggest calling the ishumar with James Clifford´s term a “travelling culture”13. In crossing the Sahara between Mali, Niger, Algeria and Libya one has to grant a certain geographical knowledge, a profound orientation on several landmarks and certain know-how how to survive in arid areas. The necessary know-how Tuareg receive already in early years within their education. Living in accordance with nature is an advantage nomads possess and have to practice in order to survive. 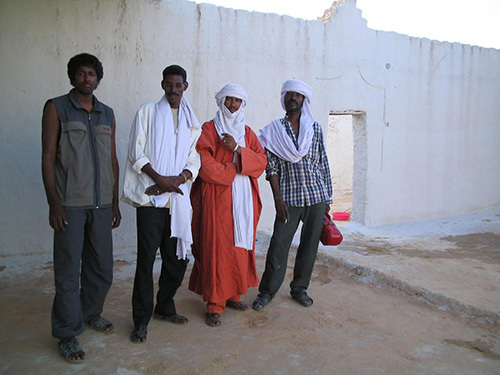 Even though national affiliation gained more importance as external boundary for Tuareg, for the intern belonging kinship is still the major element. ishumar can count on their tribal affiliations, on kinship and social and trade networks which have even formed across ethnic boundaries, and nations. In crossing borders illegally they profit from information of several kin working as militaries, police men or border guards. 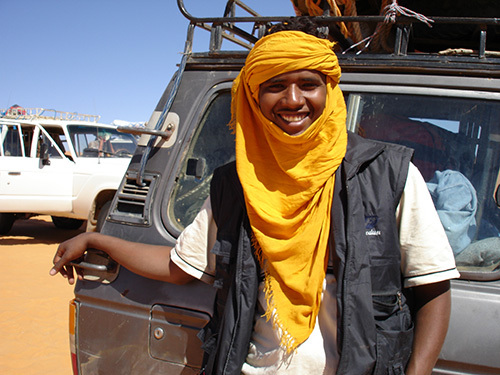 They tell them when to go, which route to take, or just let you pass without papers, just because they are both Tuareg. Tuareg from Northern Niger. Tuareg are a tribal society based on kinship. Kinship is a major element for defining belonging, and is a basis for help, assistance and support. 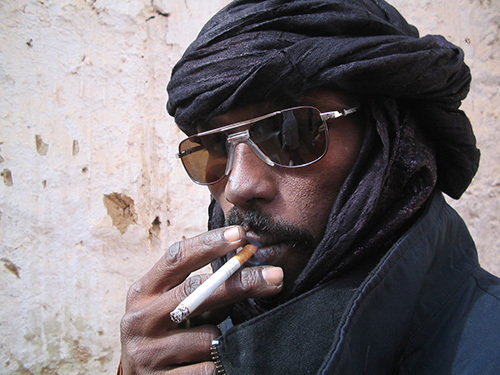 Tuareg can count on even distant kin and friends living on all sides of the borders. (Photo: Ines Kohl 2008). The increasing effort of the governments to integrate pastoral nomads in their state system is used by ishumar for their object. Meanwhile lots of them posses several citizenships and a wide variety of different identity-creating cards. Depending on where they go, ishumar pull out the respective document. The utilization of several citizenships is a strategy in order to pursuit their transnational movements, which are part of their culture and the only way of escaping their prison of political marginalization released by French colonialism, corrupt African regimes and still widely supported by European politics. Libya has issued varying ID-cards to Tuareg. 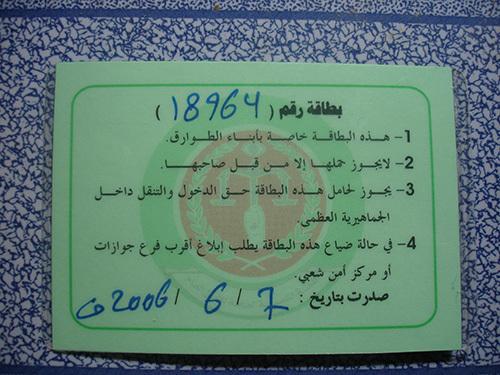 On one of them on the back (number 1) is written: hada l-bitaqa khasa bi-ibna´a at-tawariq – this identity card is exclusively for the Tuaregs’ sons. (Photo: Akidima Effad 2008). Released by European Union regulations the Saharan states (especially Libya and latterly also Algeria) are instrumentalized in order to operate as guards in order to stop illegal migration coming from West- and sub-Saharan Africa with the aim of reaching the Mediterranean See and Europe. But the European Union does not distinguish between potential Europe-migrants and local borderliners. Clandestine and illegal migration14 concerns two completely different strategies and actors: Ishumar for example move already for years without passports in the knowledge of the several governments between the borders. But in contrast to the other sub-Saharan migrants they just move in their created borderland and stay mostly in Algeria and Libya from where they return to their home countries. 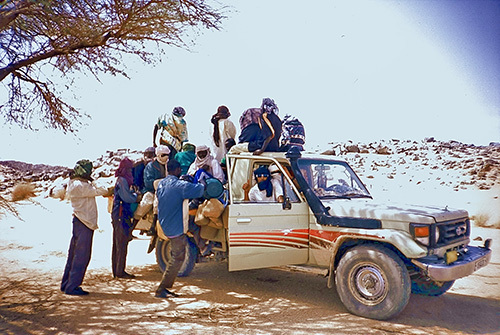 The consequences of that non reflected and inconsiderated policy affects and attacks the Tuareg as only one example of a transnational mobile society (if one collects data on African societies, one will pretty fast realize that lots on nomads and semi-nomads do the same), whose only possibility is its transnationalism in order to get better living conditions away from poverty, famine, repression and marginalization. 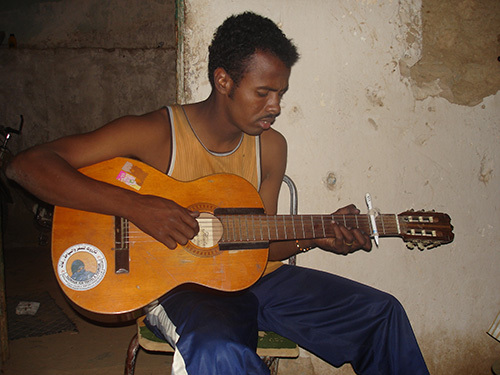 Young ishumar from Niger living in Libya sit every night together in order to play guitar, listen to Tuareg music tapes, and discuss border crossings, and dream of the future. (Photo: Ines Kohl 2007). The term ishumar (sing. masc. : ashamur, sing. fem. : tashamurt; plural fem. : tishumar) derives from the French chômeur, unemployed person, and describes those Tuareg who gave up their nomadic life and went to the surrounding neighbouring states, above all to Algeria and Libya, to look for a job. Today, Ishumar refer to a generation of borderliners whose living conditions have created special strategies. See Lecoc, Baz 2004: Unemployed Intellectuals in the Sahara: The Teshumara Nationalist Movement and the Revolutions in Tuareg Society”. IRSH 49 Supplement, Internationaal Instituut voor Sociale Geschiedeni (2004): 87–109. Hawad 1990: La teshumara, antidote de l’État, Revue du monde musulman et de la Méditerranée, Vol 57, Nr 1, p 123–140. Lecoc, Baz 2004: Unemployed intellectuals …: 93. See Kohl, Ines 2007a: Tuareg in Libyen: Identitäten zwischen Grenzen, Reimer: Berlin; Kohl, Ines 2007b: Going “Off road”: With Toyota, Chech and E-Guitar through a Saharan Borderland, in: Klute Georg & Hans Hahn (Hg. ), Cultures of Migration. African Perspectives, Berlin, p 89–106. 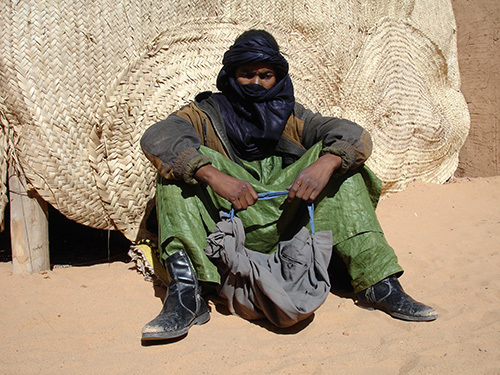 Claudot-Hawad, Hélène 2006: A nomadic fight against mobility: The Tuareg in the Modern State. In: Chatty, Dawn: Nomadic Societies in the Middle East and North Africa: Entering the 21st Century, Leiden, Boston, p 662. See Kohl, Ines 2009: Beautiful Modern Nomads: Bordercrossing Tuareg between Niger, Algeria and Libya, Berlin: Reimer. Kohl. 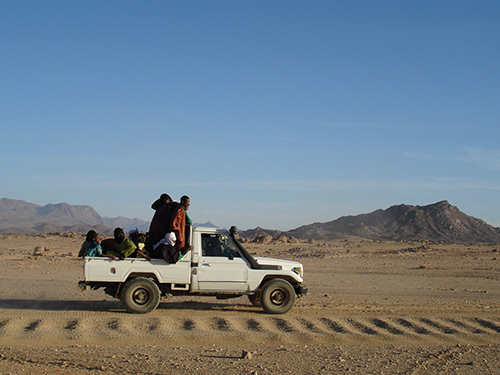 Ines 2006: Von Tuareg, Toyotas und Wüsten Geschichten: Sahara-Tourismus in Libyen, in: Integra, Zeitschrift für Integrativen Tourismus und Entwicklung, 2/06, p 14–17. Claudot-Hawad, Hélène, Bonte, Pierre 2000: Elites du Monde Nomade Touareg et Maure, IREMAMAM 13/14, Marseille: Edisud, p 6. Claudot-Hawad, Hélène 2000: Elite, honneur et sacrifice. In: Claudot-Hawad, Hélène, Bonte, Pierre 2000, p 18. Giuffrida, Alessandra 2010: A Systemic Approach to Networks of Mobility and Stasis of Local and Global Tuareg”. In Kohl, Ines, Fischer, Anja (Ed. ), “Tuareg Society within a Globalized World: Saharan Life in Transition, London: Tauris, p. 23. Clifford, James 1992: Travelling Cultures. In: Grossberg, L., Nelson, C. Treichler, P.A. (Ed.) Cultural Studies, New York: Routledge, p 96–116. Clandestine movements elude registration and statistical coverage, which means that somebody enters a country without an entry visa and identification. Illegal, on the contrary, defines “overstayer”, people whose entry visa or residence permit has expired, nevertheless they stay in the respective country. See OECD Annual report (1999): Trends in International Migration.